As the world is aware on Sunday, Oct.1, 2017, Las Vegas locals and visiting tourist became the target of a senseless, evil mass shooting. This attack took place at the Las Vegas Route 91 Harvest Musical Festival at Mandalay Bay Hotel & Casino. Words cannot express how heartbroken and devastated our great city and community are. It will be difficult to deal with the aftermath of this horrific incident. 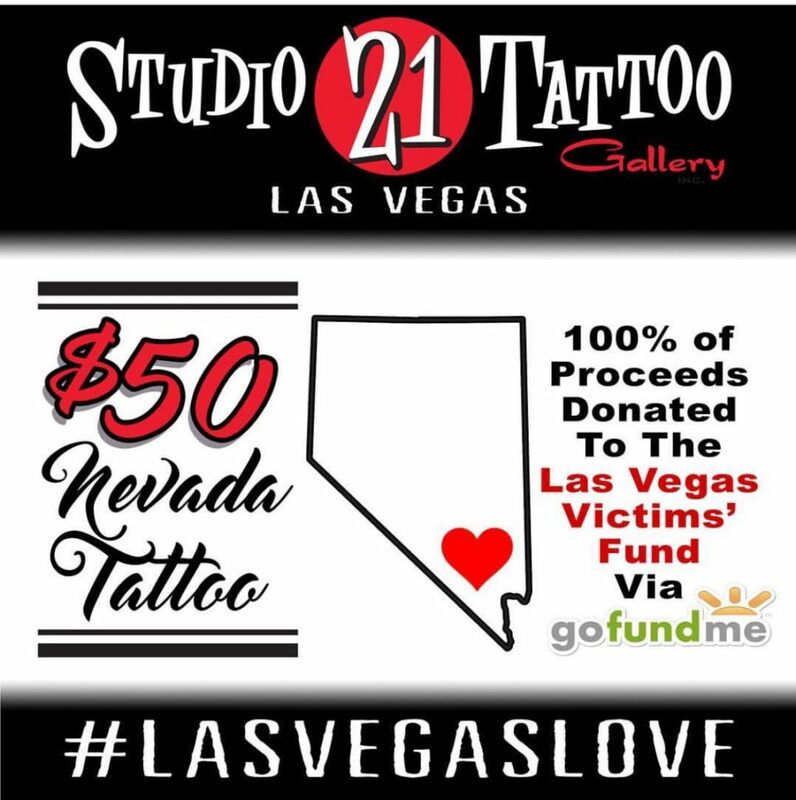 Studio 21 Tattoo Gallery organized a fund raiser to help raise money for the Las Vegas Victims @GoFundMe set up by Steve Sisolak, Clark County Commissioner Chair from Las Vegas. The funds will provide relief and financial support for the victims and their families. Studio 21 Tattoo Gallery will be offering the state of Nevada outline with a red heart in the lower sector representing Las Vegas. All proceeds (100%) received will be donated to this fund by Studio 21 Tattoo Gallery. Due to the volume of tattoos being done, there are no substitutions to the existing design offered. For those who cannot give blood, this is a good way for our tattoo enthusiasts to show their love for our community. If you prefer to opt out of the tattoo, you are welcome to come by the shop and donate money to the cause or you may go direct to Las Vegas Victims’ Fund @GoFundMe. The amount of support that our local community has shown is overwhelming and greatly appreciated by the owners, staff and all of our tattoo artists who are donating their time and talent to help the victims. At current count, 59 people have lost their lives and over 500 injured, let’s try to help them in any way we can. Please follow us on Instagram @studio21tattoo.com and FB https://www.facebook.com/Studio-21-Tattoo-Gallery-206119829429/ for updates on the #Las Vegas Love Fundraiser. The following are links to information you might find helpful.